It’s April and that means Easter-y goodness all over the place. I always look forward to holidays with my family. When I was younger, my sister and I would wear matching outfits, complete with bonnets and purses. Yes, we were quite the little beauties. Easter morning we would wake up with great excitement since a large rabbit visited our home and left us baskets full of jelly beans and chocolate treats. Amazing. I love those memories! I’m still a big fan of Easter baskets. They are such a fun tradition. My hubz didn’t know how awesome holidays would be when he married me. :) This year I’ve opted to create a unique Easter basket for me, my husband and our live-in adopted daughter, Macey. 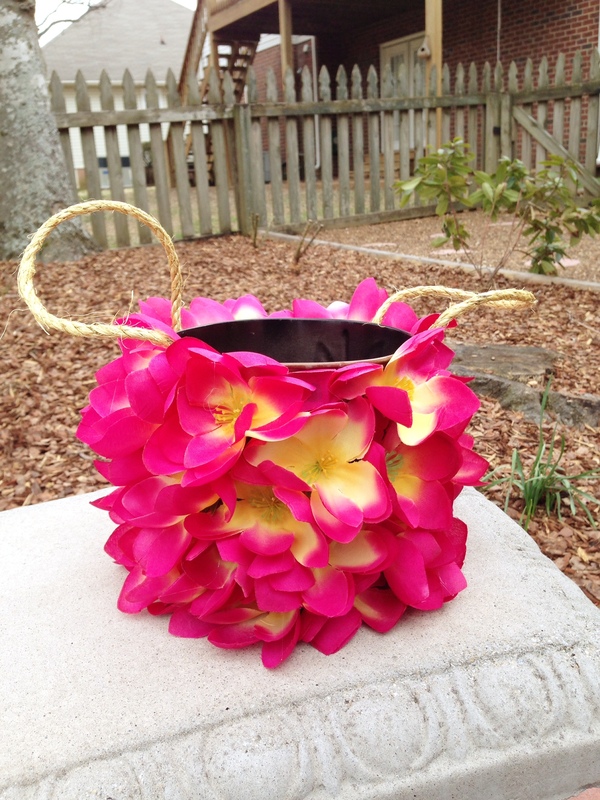 For my hubsy, I started with a plastic pail from the Dollar Tree ($1.00). 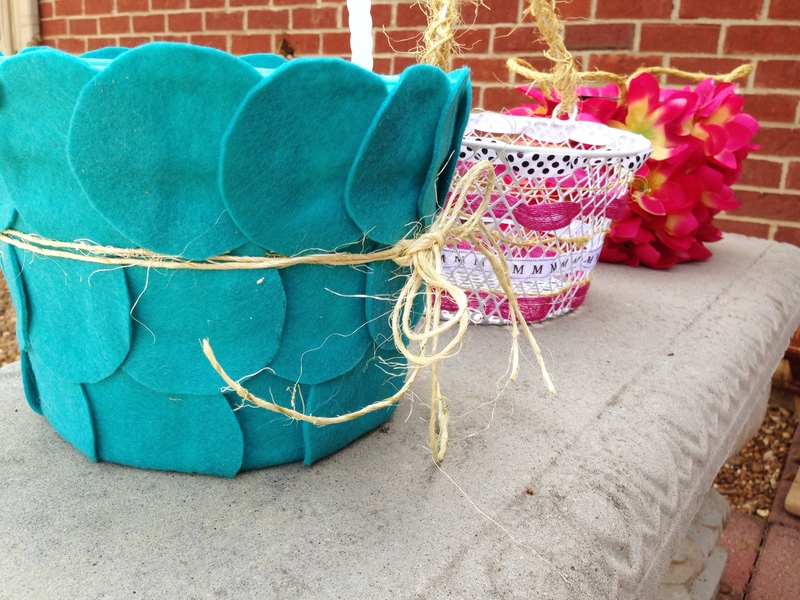 I bought some felt from The Hob ($1.00) and cut it into circles, then glued the circles in an overlapping fashion all the way around the pail. 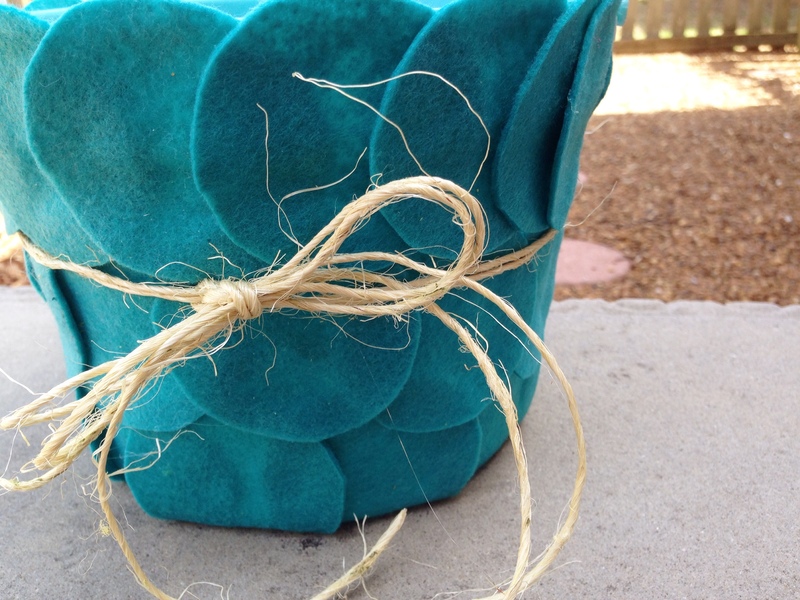 Then I grabbed some twine I had on hand and tied it around the pail to give it a finished look. I love the result and it just cost me $2.00! 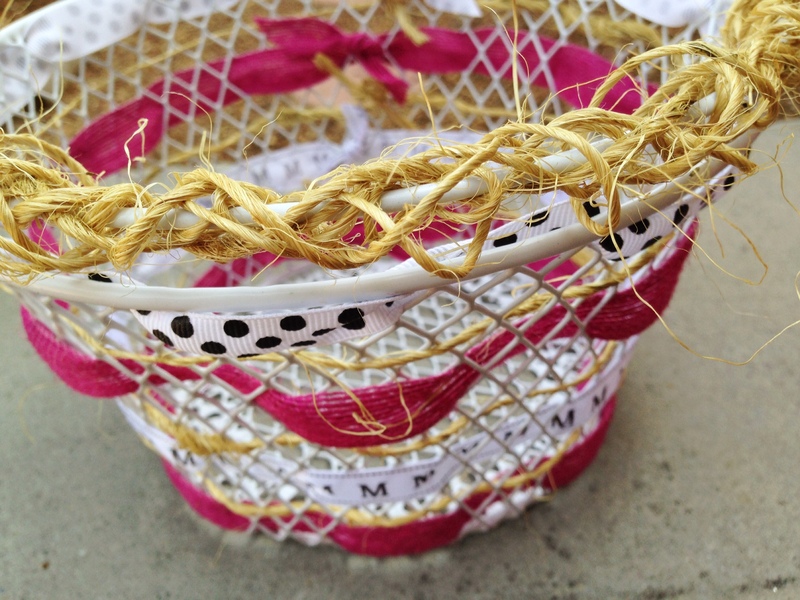 Next, for Macey, I bought a wire basket from the Dollar Tree ($1.00) and some ribbon from The Hob ($2.00). Then I wove the different ribbon in and out of the basket. To finish it off, I wrapped twine around the handle, and it turned out so cute! Last, for my basket I bought a metal bucket and a bouquet of faux flowers, both from the Dollar Tree (just $1.00 each!). I started by pulling the flower heads off of the bouquets and cutting the stem so that the flowers would lie flat against the bucket. I whipped out the hot glue gun and got to glueing. For the handle, I used my thick jute rope and cut a piece for each side to make two handles. It turned out so flowery and lovely! These were all super simple, and so inexpensive. I love them all! 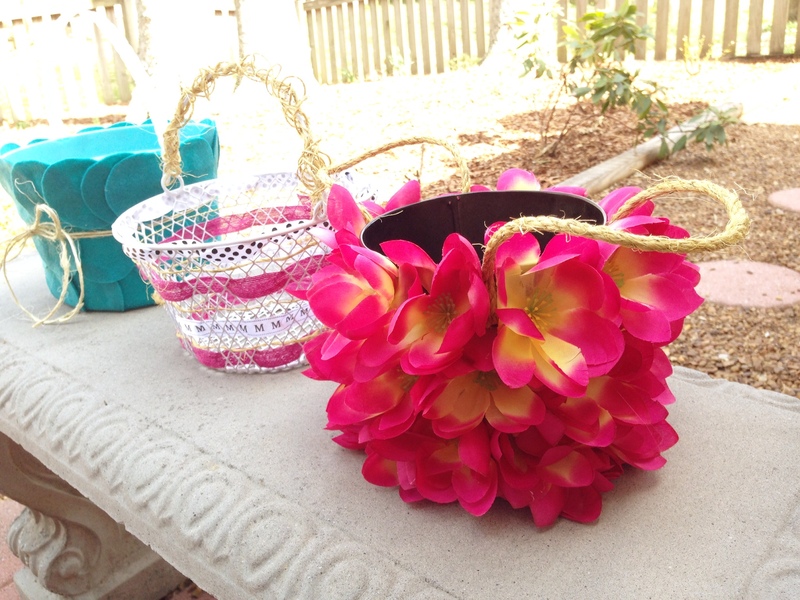 What are you doing for Easter baskets this year? I remember getting all dressed up as a little girl to go to church on Easter Sunday. I was born in 1940 so we wore gloves to church and little white patent shoes, how I loved my outfits. I love that, JaneEllen! I think we wore gloves and patent leather, too… so many wonderful memories! Thank you for your kind words about the Easter baskets. I love the floral one, too! :) Have a great weekend!